I learned Monday morning that another Cyclopath, Susan Redfield, passed away from pancreatic cancer over the weekend. I'm stunned. 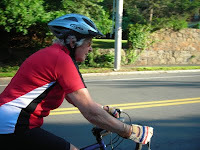 Susan had hip surgery a few years ago and hadn't been riding with the Cyclopaths as often. Still, she'd occasionally meet Donna and Sheldon and me on our Tuesday/Thursday loops around Marblehead Neck. Susan was an amazing athlete. I took this photo of her riding in Manchester a few years ago, and she berated me for not paying attention to the road. (It sounded quite lovely in her English accent.) I really enjoyed riding with Susan and I'm truly saddened by this news. It's been a tough year for the Cyclopaths.